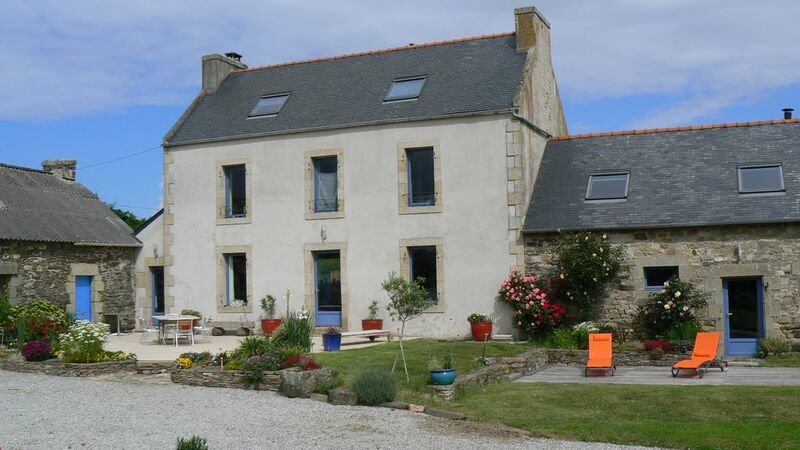 Situated on 10 000 m2 (square meters) large plot this country house has a 180 m2 area with a lage terrace. It's an old farmhouse that was renovated in 2010. On the ground floor, a large contemporary kitchen is open on a living room with a sofa and a TV. It's a spacious and bright room. On the left of the kitchen you have an access to the utility room with a washing machine and a tumble drier. On the right of the living room, a small corridor leads to a large 60 m2 room with a big round bath. We call it the master bedroom. Contiguous to the room, you will find a bathroom with an italian shower and two sinks. Above this room, we created a mezzanine with a sofa and a large TV to watch all your favorite movies (Feel free to bring some DVDs or movies on USB key). Independant WC are situating in the small corridor between the living room and the room. On the first floor, there are two rooms (an individual room and one with two simple beds that can be assembled to make a double bed). Between the two rooms there is a bathroom with a shower and two sinks ans separated WC. The 4th room is located on the 2nd floor , it has a double bes. You will also find a small living room with library society game and lego/playmobiles. Our house is located in a protected area, on the rigth of Douarnenez's bay. The closest beache is "Kervigen". It's a family beach, ideal if you have young children. When the tide is low there are beautiful pools where young children can wade. We live within 1 km of the rental, which allows to move quickly if there were problems in the rent. We have three girls (Marina , 17 , Sarah 15 and Laura 12 years). If you are looking for space and quiet you have found the right location. With a very large outdoor area , children can run and play ball. A barn is available with table tennis. The advantage of our location is that it is located halfway between the northern and southern Finistère, ideal for visiting the sights of Finistère. We stayed at this lovely house with our 2 children for 12 nights. It was really well presented - very clean and comfortable, with a well equipped kitchen and beautifully kept garden. The interior of the house is a mix of old & new, with a quirky lay out that our children loved - especially the mezzanine floor with huge TV screen & sofas for watching films. The owner was charming and met us on arrival, showed us where to pick fresh tomatoes & eggs in the garden, and left us with home grown courgettes & potatoes. We were then left to our own devices to enjoy the location - its spectacularly quiet, with bags of charm. The local beach is a 2 minute drive & is huge, sandy & mostly really quiet. Our kids loved it. The house is in a good position to explore both north & south - we loved the Crozon peninsular & Lacronan. This is a great choice for families who need a bit of space but want peace & privacy. Would thoroughly recommend it. Auch in diesem Sommer haben wir den Aufenthalt in diesem wunderbaren Ferienhaus in vollen Zügen genossen! Drei Schlafzimmer mit Bad im Haupthaus und das Luxusschlafzimmer mit Bad und Wirlpool im liebevoll gestalteten vom Wohnbereich des Haupthauses übergehenden Anbau, der großzügige Wohn-Essbereich , die Loungeatmosphäre im großen Dachstudio und natürlich der herrliche Garten, der zum Toben, Relaxen ....einlädt : all das haben wir mit 6 Erwachsenen ( im Vorjahr waren wir mit 5 Erwachsenen und 2 Kindern da ) total genossen. Morgens mit den zwei zum Haus gehörenden Fahrrädern zum Strand fahren, Ausflüge nach Locronon, Quimper,zur Pointe du Raz,auf die Halbinsel nach Crozon / Morgat ....es gibt viel zu sehen in dieser Ecke für Bretagnefans ! Aus dem Garten durften wir uns Tomaten nehmen,der sehr nette Eigentümer brachte uns Eier und Gemüse und war jederzeit für Tipps und Fragen ansprechbar. Wir hatten eine sehr schöne Woche in dem bestens ausgestatten Haus. Empfangen wurden wir sehr nett von Daniel. Über Eier, Tomaten und Zucchini aus dem Garten haben wir uns gefreut. Besonders die Ruhe und der viele Platz haben uns sehr gefallen. Viele Ziele in der Umgebung waren sehr gut zu erreichen. Wir haben wunderbare 12 Tage in dem Haus verbracht! Die Anreise aus Norddeutschland war gut mit einer Übernachtung zu schaffen! Das Haus ist sehr großzügig eingerichtet und war für uns (4 Personen) perfekt. ES ist sehr gut ausgestattet mit allerlei Küchenzubehör und genügend Gläsern, Tellern etc. Darüberhinaus war das Grundstück mehr als groß genug! Wer mal richtig "runterkommen" möchte, ist hier genau richtig! Rings um das Haus ist das große Grundstück und (bis auf eine kleine Straße, die kaum befahren wird) dann lange Zeit Nichts! Man geht ca. 15 Minuten zum Strand, der absolut traumhaft ist mit einer kleinen Bucht und zum Baden einlädt. Hübsche kleine Städte sind gut in 20 -30 Minuten mit dem Auto zu erreichen! Wir waren das erste Mal in der Bretagne und absolut begeistert!!! Ein sehr schönes Haus in ruhiger Lage fast am Strand. Wir hatten eine wunderbare Zeit. Der Vermieter ist extrem freundlich und hilfsbereit. Schönes grosses und sehr sauberes Haus in einer tollen Gegend der Bretagne. Wir hatten eine super Woche. Das Haus liegt in ruhiger Alleinlage und hat einen riesigen Garten.